Haiku Deck | Teaching with Technology! I am participating in Day 6 of the Slice of Life Writing Challenge where I am blogging every day during March. Thanks to twowritingteachers.wordpress.com for giving bloggers this challenge! Today was a milestone day for me. Why? Well, let’s just say that I achieved a goal that I had given myself. I was notified in early December that I had been selected to be a presenter at the 2014 NCTIES Conference in Raleigh, NC. Today was the day of my Presentation and from all indications, it went very well. The Conference Coordinators had emailed stating that as many as 140 people could fit in my room. As of last night, I saw that only around 40 people had joined my Edmodo group for the presentation. I took my iPad and a borrowed laptop to my presentation room last night just to check and be sure that I could quickly hook up the cords to the right ports to take the stress off of me about the hardware working properly. When I got to the room today, Room 302A, there were already a few people trickling in. I hooked up the hardware, had a sound guy give me a microphone necklace and propped up books that I would reference. Almost as if floodgates opened, a continuous flow of teachers entered the room filling every row. Second by second I was feeling exhilarated while also feeling a bit shocked and happy with the turnout. It made me feel so good to know that people had chosen my session out of many others occurring at 10:00, especially when I just had expected 40 people. More and more teachers came down the aisle with around 20 sitting on the floor at the front near me and a row of 20 standing in the back. My heart fluttered. After the time I had spent putting together my presentation using Haiku Deck, I wanted to deliver to my audience 45 minutes of my K-5 Technology Projects that I have done with my students. With people standing in the doorway and in the hall trying to hear and see, I began my journey in Room 302A with around 180 eager educators! I began my presentation with a special You Tube video that I just recently discovered. It is called, “Obvious to You, Amazing to Others”. It speaks to the fact that as teachers we sometimes don’t think that our ideas are all that unique at times. Every other teacher is working hard and being the best them. But, now, I am hoping that some of my ideas ignited a passion in my listeners. They may have already known about my topic, but I would guess that there was something in my speech, in my Haiku Deck of slides or in the Google Drive Doc which I shared that resonated with the audience. Based on the positive verbal comments after my presentation was over and throughout the day when seeing people in other sessions, I feel that it was a success. I shared some digital projects that now seem obvious to me to do with children after doing Interactive Read Alouds with them, but these projects appeared to be new to 70% of the audience when I polled them. What an honor it was to share with these dedicated educators who are passionate about implementing best practices in their schools! My technology mentor, Jill Thompson, called me on Twitter a #ncties14 rock star! I have reflected a lot about my talk and realize that I probably over planned, but judging from comments, I am pleased to say that I reached a milestone by accomplishing my goal. With whom could you share this video to encourage them to take a leap of faith and share? This is Day 2 of the month long Slice of Life Writing Challenge given to bloggers by twowritingteachers.wordpress.com. Due to Publix Grocery Store just opening in my town, the store was packed this past Saturday. As I entered I immediately purchased a hot cup of coffee to be by my side to further enjoy my experience. There were carts all around the right side of the store including tastes of Key Lime Pie in tiny plastic cups with miniature spoons, carrots with ranch dip, chocolate covered raisins, roasted red pepper hummus on chips, chocolate chip cookies, steamed shrimp, and a plate with cooked orzo pasta, chicken and tomatoes with a side of spinach doused in a raspberry viniagrette dressing. Needless to say, was impressed. I like to taste food when I go to Costco and have come to expect it there. Now I know that Publix also has a mini kitchen, I will look forward to visiting it and getting meal ideas. I even picked up their brand of orzo pasta, a bag of spinach and the raspberry vinagrette dressing to make my own version of their Chicken and Orzo pasta. One could say that I was inspired to use simple ingredients to make my own meal because of what was demonstrated at Publix. This idea of food sampling and demonstration in the Publix mini kitchen got me thinking about not only how much my shopping experience was enhanced, but also about how the store made an effort to reach out to me. After having a lesson in humility in the parking lot which I wrote about in my previous post, I came in the store needing a refreshing experience. There were possibilities everywhere of food samples which really hit the spot. I was also a bit shocked to see the floor space of the new Publix jam packed. I became aware immediately that my shopping cart would have to wait while others navigated to each of the food stations then I’d get to wiggle my way through the maze of carts and people. Within the sea of rolling carts and customers I noticed a huge presence of staff with professional shirts on with Publix embroidered on them and name tags that had a special touch. I inquired about where to find chocolate covered blueberries in a bag and one of these workers immediately told me that he’d find out, go to find them then look for me to let me know. Now, truthfully, he must not have been able to find me because he never came back. I had wandered over to the bakery to taste the Ganache cake, so it was no problem that he could not locate me. I didn’t really need the chocolate covered blueberries but nevertheless, I was impressed that he was willing to stop everything and help me. As I drove my cart to another section, I saw lobster bisque being dipped by a customer into a bowl and noticed a nook in the corner of the store behind the Deli where people could have lunch and not have other customers run into them with their carts. I asked an employee with her hair net on for sanitary reasons who was giving out cheese samples if Publix has a schedule of which soups will be served each day kind of like McAllister’s Deli has a schedule. She did not know, but went away for a minute, then returned with the answer which was no. Finally, I guess I was just staring into the prepared meals counter when the employee behind the counter inquired about helping me. The food planners enticed me with the colorful and diverse amount of food that had been prepared and presented extremely effectively like chicken dishes, steak, vegetables and pastas. The man behind this counter with his hairnet on volunteered this comment: “It will stay like this will all of these choices for a while until we see what will SELL in this area.” Wow, they respond to their customer’s likings and won’t carry items that the public will not buy. Pretty smart for them and good for me to know that they will cater to the community. I continued to roam around looking at their clean, bright and well designed store and found the rest of the items that I needed. As I approached the checkout, I realized that a Publix employee was standing not just behind the cash register but also in the check out lane to GET MY GROCERIES OUT OF MY CART. I didn’t have to bend down and get them then put them on the black conveyor belt. I just stayed behind the front end of the cart. I asked this employee if getting out my groceries from my cart was a normal experience or just part of the grand opening and she made a statement that has resonated with me. She responded with, “It’s just part of our service!” As I paid, I asked the cashier if I needed to ask for help to take my groceries out to my vehicle. There was a lot going on with people leaving and some commotion, but then I looked to my right and saw a young guy holding on to my cart ready to take it outside. The cashier told me, “You won’t ever have to ask for help with your cart at Publix. It’s just part of our service!” Again, WOW. I can tell you that my lovely experience as a shopper in Publix has gotten me excited about driving just a little farther away to get my groceries when I need them because of their focus on me, the customer. They were looking to make a connection with me by their food tasting carts, the food preparation going on in the kitchen and the focus on customer service with my groceries as I had questions and at the checkout. I appreciate that my needs were anticipated and that everyone, except the one guy who never came back, responded with a quick and professional response. I really do not hold a grudge against the guy who looked for the chocolate blueberries, but as a teacher, I was reminded that we should never tell our students that we’ll do something, then never follow through. As a teacher, I like to give my students a similar smorgasbord of digital possibilities like the food cart experience I had at Publix. It opens them up to experiencing new ways of responding to text. The critical piece of teaching is anticipating the needs of students and teaching in their Zone of Proximal Development, as Vygotsky would say. (I realized his wisdom in college and always come back to it.) Publix knows that customers can cook but having the demonstration station allowed me to see the ingredients sitting out, a “more knowledgeable other” preparing the food, the recipe cards readily available and the items I needed sitting right next to the Demonstration Station in a cooler. I enjoy demonstrating how to think like a reader and share how a reading strategy impacts me as a reader with my students while I am reading aloud to them. I ask them to Turn and Talk to discuss questions that I pose so that they are a part of this collective thinking about a book. Next, I give them assignments that are within reach for them to accomplish by scaffolding the lesson to include a demonstration of how to use a digital tool. As they are working, I walk around as a guide on the side to facilitate their understanding of using the app on the iPads or using a tool on the computers. I try to be customer service focused with my students and respond to their needs. I can say with assurance that the power of demonstration goes a long way to helping kids feel empowered to use the digital tool. During this time of year, students can look back over the year and choose to use an app that they liked from the past that I had shown them. As students read or view digital media, they can use their finesse with technology to create projects like Discovery Education Boards using Board Builder or Haiku Deck presentations among many others. I like that they can choose to use apps that best fit their purpose to do a project. Having choices, like the food carts at Publix, and knowing that I am there to help them along with their peers, gives students the confidence that when they come to my class, they will have a positive experience. This is just part of my service to them! I would love to hear ways that other teachers use to help students anticipate a positive experience as they enter each day. What do your students look forward to that is part of your service to them? This past week I asked my Kindergarten students to use the Doodle Buddy app to stamp groups of ten objects and label each row. I recently got an Apple TV which allows me to share students’ work on the iPads on my big screen. When pairs of students finished creating as many rows of ten as possible, I would say, ” Would you like me to show your work on the screen?” Every group would say, “Show mine!” The ability to choose the Airplay function on the students’ iPads allowed me to share their work. We all like a little recognition, I suppose, so the faces of the students whose iPads I showed beamed when their work was displayed. I could see that some students were labeling their second row of 20 as “11” and the third row of ten objects as “13” where the number three was written backwards. I was able to help these students count the stamps on their second row and then rewrite the number “20” at the end of the row. Their misconceptions helped me to know how to guide them to a correct way to label groups of twenty objects, thirty objects, etc. 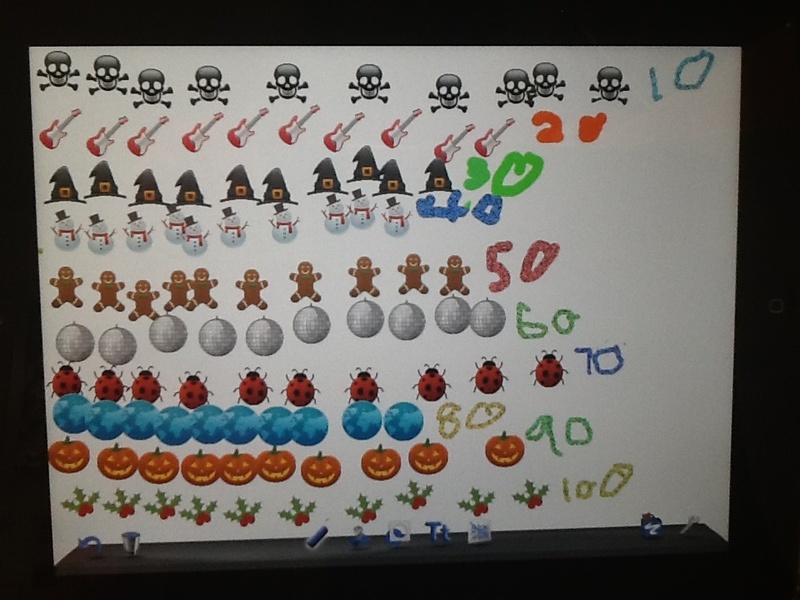 Using Doodle Buddy’s features is an effective way for students to demonstrate their understanding of math. I loved that my students wanted me to share their work because they collectively contributed to their ongoing story of how counting objects works! 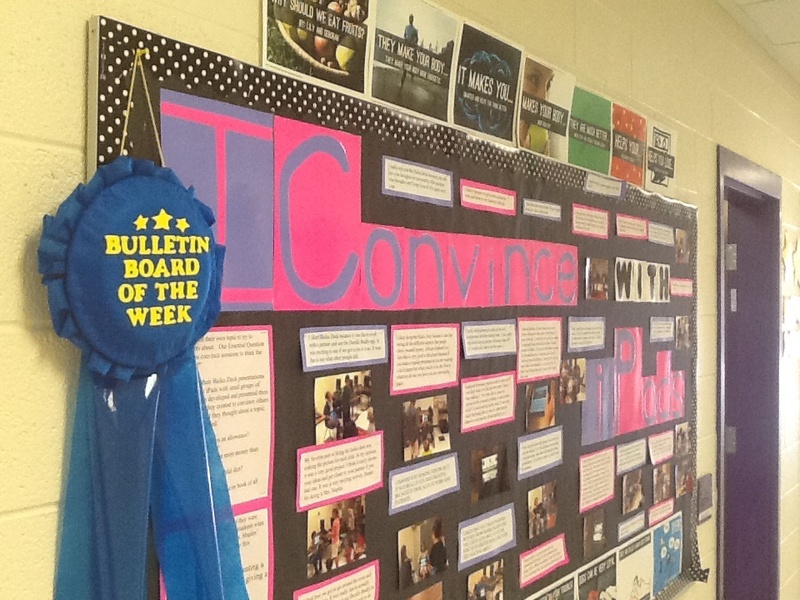 I also received a nice compliment this week when my bulletin board in the school hallway was chosen as “Bulletin Board of the Week”. I had showcased my students as they presented their Haiku Decks about a topic of their choice and as they gave mini Ted-like talks to deliver their presentations. I had also printed some of their written comments that they had typed in Socrative, a free app that allows students to give teachers comments as exit tickets. If you would like to read more about this project, please reference my October 2013 blog post. I was thrilled that my board was shared with the staff in the weekly letter that my principal sends as being as good one. There are so many reasons to celebrate students’ work! Last December, I decided to introduce how to create an iMovie to my 4th and 5th graders. As they came to my Computer Classroom, I showed them the following YouTube video which give a nice explanation of how to create an iMovie: http://www.youtube.com/watch?v=AXrIdMVdVNA I knew that some students already had some prior knowledge of creating iMovies or iMovie trailers from being in my fourth grade class last year or from having their own device. One fifth grade class had recently even created an iMovie to show area businesses to convince them to support our school as we raise funds to purchase a new playground. Students were captivated by the video and seemed excited about the possibility of us creating iMovies in the future. I printed one Storyboard for each group in each class to use for the rest of the week. I was thrilled that they embraced the Storyboard sheets which had six boxes with lines under each one to give students an idea of a scene that they wanted to film. Next, they would sketch out what they wanted the next speaker to say and show. I was much more pleased with the structure in place to give my elementary students the proper support to plan their iMovies. I am very excited about the coming week as we will start to film each class as they explain their digital products and projects using Haiku Deck as a presentation tool, Discovery Education’s Board Builder, Hour of Code, Blogging in Gaggle, and apps that they wanted to showcase such as Santa Engineer, Mathamateer, and Science 360. The White House Film Festival is seeking examples of how students use technology as a creation tool, how students use technology in new ways, and how they use technology to access high quality online content and resources such as the Dreambox, an online Math program that my school district has purchased. Some student groups wanted to share how they are using Dreambox and how it motivates them to play a variety of games that adapt to their level. Other groups wanted to showcase the excellent web resource www.wonderopolis.org and www.ncwiseowl.com which they had used in their research to create their Discover Education Digital Boards. At my website, bit.ly/elonpark, I had given the following directions at the fifth grade tab during second quarter: Visit Class DOGO news site below and write a blog post about it in your Gaggle Blog. 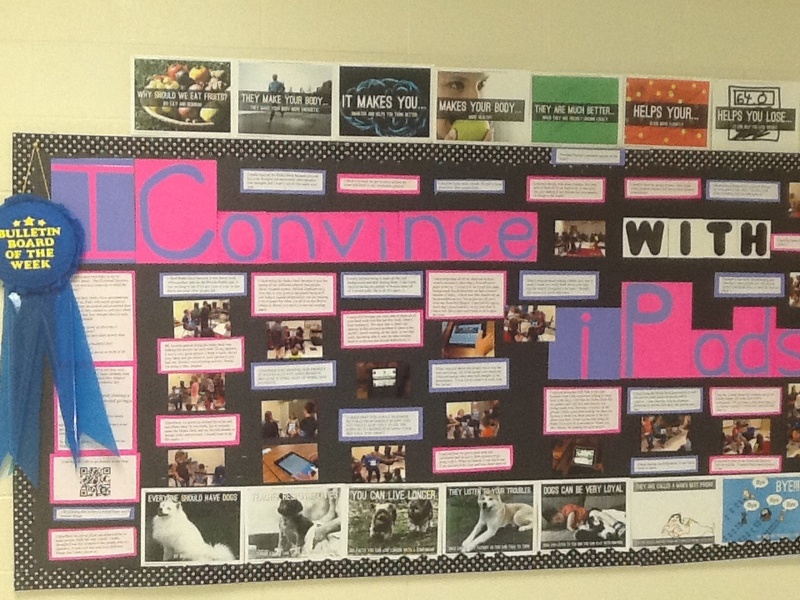 Read other students’ blog from your class and write a TAG Comment (Tell something, Ask a Question, Give a Suggestion). Students are new to blogging but many of them enjoyed reading the Class DOGO article about Batkid in San Francisco, CA then creating a blog entry to describe their response. They are becoming online communicators and using acronyms like TAG to help them remember how to conduct themselves as responsible members of the digital community. It will be interesting for me to see how the Gaggle Bloggers group will discuss blogging not just about themselves but also about articles that they’ve read. When I read “And Action!…” during the Winter Break, I discovered that it is wise to show students three ways to plan an iMovie: a character driven film, an event driven film or issue driven film. I introduced the project to students by telling them that the film will be structured as an event narrative so that the viewers can see the series of events or projects that we have done. I told them that they would need to introduce the topic in a way that will draw the viewers in. I posed the question, “What image or quotes would you want to use?” Some students whose natural passions are toward communicating creatively would give great ideas in each class and would arrange themselves to plan their part of the film on the Storyboard sheet. The White House Film Festival movies are due by January 29 so time is of the essence. If I had more time, I would allow students to generate a fuller script for each person to say during the movie. In the future as they research an Essential Question, I will ask them to locate images that support their findings and to create iMovies about these powerful images with developed scripts of narration to read as the images are shown. The process that I have had them go through has been setting them up to do small group research online then to create an iMovie after careful thought about their presentation by planning it on a Storyboard. Students need support as they plan presentations and not just be told, “One of your choices is to make an iMovie.” I think that students who used the Storyboard sheet felt confident as to how they would present their digital product or project and will be able to use this support structure in future iMovie projects. Giving students the chance to collaborate in small groups to plan their part of the iMovie was a needed scaffold because they were able to frame their piece of the whole movie, so in essence, I used the Jigsaw technique to arrange the class. Some classes wanted to even bring their own digital devices to my class to show how they are using BYOT during the school day so their part of the iMovie will also contribute to the overall feel of how we use Technology all day at school, not just in the Computer Lab. Next week, we will put all of the pieces together and film the iMovies! I will mirror the iPad that filmed the iMovie on the board using our Apple TV, then have students decide how to best edit the video clips of each group, add any voiceovers, add text to screens, and add music. I will upload their iMovies to my YouTube channel then enter each 4th and 5th grade class into the White House Film Festival by January 29, 2014. I know that my students will use the 45 minutes that they have in my class to creatively present their group’s digital product and show that they are using technology to communicate, critically think, collaborate and create as 21st Century Learners. They will be creating documentary, event driven films for the world to see! I was asked by my technology mentor, Jill Thompson, to write a Guest blog post on her blog, Inside The Classroom, Outside the Box. She published my Guest blog post yesterday. I am placing the link to her blog below because it explains a multi-week project that I did with my fourth and fifth graders whom I see once a week for 45 minutes either in their class with iPads or in our school’s computer lab. This project was my first experience using Haiku Deck as an app on the iPads! Students created Haiku Deck presentations during the past several weeks then presented them today using the TED Talk format. After presenting in small groups, I directed students to go to my virtual classroom that I had created using t.socrative.com. I have selected some of their comments and placed them below. Collectively, they show that students LOVED this project. I have not edited their comments below so there are plenty of misspellings, punctuation errors and capitalization errors. Nonetheless, I was blown away by gathering feedback from students for the first time using an Open Ended Written Response Question in Socrative as my Exit Ticket. i liked it because it makes kids feel creative about sharing their ideas with others. I love to see what other people thought of their subject even if i disagreed. It was also fun to perform our ted talk to the class and see if they were convinced or not and to see if they liked what we did! Other people had really convinced me to do what they think. I hope we can do it again this year. I liked going around the room seeing what people think. It was fun because it was something new we did.It was also fun because people got to chose what they wanted. I liked it because people liked our presentation. Most people picked yes on ours we got one no but, that didn’t get me upset! Its always good to get a lot of yes’s than no’s!!!! We didn’t really get to plan what and how we were gonna say it but it all went well. My partner and I liked it I think well I did! I enjoyed it because it lets you show your creativity. You also have fun with it. Some people were not persuaded but I still had fun and I will fix my mistakes next time. I liked how it helped me be able to present by using 2 diffrent apps at the same time. I think it was amazing because you get to experss your self of what you think. I enjoyed making my point about why we should recycle. It was fun to make a Haiku Deck presentation and do a Ted Talk. I enjoyed listening to other peoples presentation to see what they thought and me getting to say what I thought. And plus I think its pretty cool getting to share things by pictures. What I like about the Ted Talk on Haiku Deck was you have to make your point in one or two words.Also when people were presenting there phrases underneath there big concept. i thought it was cool to see what other people think about recess. we got all checks. this was so cool miss.Maples is the best technology teacher EVER.these projects are so cool.she propaly has many more coming.i am starting to love it even more then ever.these are great learing projects that i have never done. I liked that you get to see what other people created and what the topic they typed about.An other thing that I like about the TED talk was you got to write down if you where convinced or not.The pictures where also another thing that I liked.Also, Haiku Deck can help you convince people and it was nice learning how to use Haiku Deck.Thanks Mrs.Maples! I LIKE HAIKU DECK BECAUSE YOU CAN CREATE OR SEE A PRESENTATION.ANOTHER THING I LIKE ABOUT HAIKU DECK IS YOU CAN TRY TO CONVINCE OTHER PEOPLE OF WHAT YOU THINK.WHAT I LEARNED IS HOW TO CONVINCE PEOPLE TO THINK HOW YOU THINK. I did a presentaiton on why kids should get an allowance. But my favorite part was finding cool pictures and geting notes .I loved it !!!!!!!!!!! i felt very joyful after everyone said it was good. it was very hard to gather notes and find the pictures, but i felt happy doing it. I would love it if we could do some more projects/presentations on haiku deck! I think this was really enjoyable experince because I got to convince my peers to go with my opinion, and create a really fun haikudeck. I ENJOY MAKING A TED TALK BECAUSE I LOVE TALKING ABOUT I WANT TO WRIGHT ABOUT. I LOVE HAVING A TED TALK ABOUT THINGS I LOVE. MORE PEOPLE LIKE TO TALK TO MORE PEOPLE. I really enjoyed haiku deck.I really enjoyed how you could display your ideas on different slides and present a ted talk on what you chose to do it on I really enjoyed what I did on haiku deck. I really liked Haiku Deck. I loved how we got to share our TED talks to our classmates. I also learned that different people have different opinions, and that is okay. Having different ideas is what allows us to learn. I learned allot from my classmates presentations. I learned more about their topics and my classmates.